My love affair with kantola continues as I try to make the most of this elusive vegetable which is nearing the end of its season for this year. Today’s recipe is another experiment from my kooky kitchen. I wanted to try out kantola paired with another vegetable in a curry (as opposed to a dry version). Pumpkin came to mind because of its contrasting texture and taste. The sauce is yoghurt based to give a bit of tarty kick. I have also thrown in some tomato for good measure to boost the nutritional value of the dish. Will go equally well with any type of bread or rice. Serve some sliced onions doused in lime juice on the side. Wash and dry the kantola. Depending on their size, either quarter them or slice them. Wash and cube the pumpkin. I prefer to leave the skin on but you can peel it if you wish. Peel and slice the garlic along its length. Chop, wash and dry the coriander. Once it is hot, lower the heat and throw in the mustard seeds followed by the carom and fennel seeds. Stir around for 30 seconds. Add the sliced kantola with salt to taste. In the meantime, whisk the yoghurt and add all the spices: coriander powder, cumin powder, garam masala powder, turmeric powder and paste of ginger-green chilli. Mix well. Return to the kantola. Uncover the pan and add the pumpkin, tomato and garlic. Add the spiced yoghurt mix. Combine everything together, cover and cook for 30 minutes till the vegetables are soft. Take off the heat and let the curry rest for about 5 minutes. 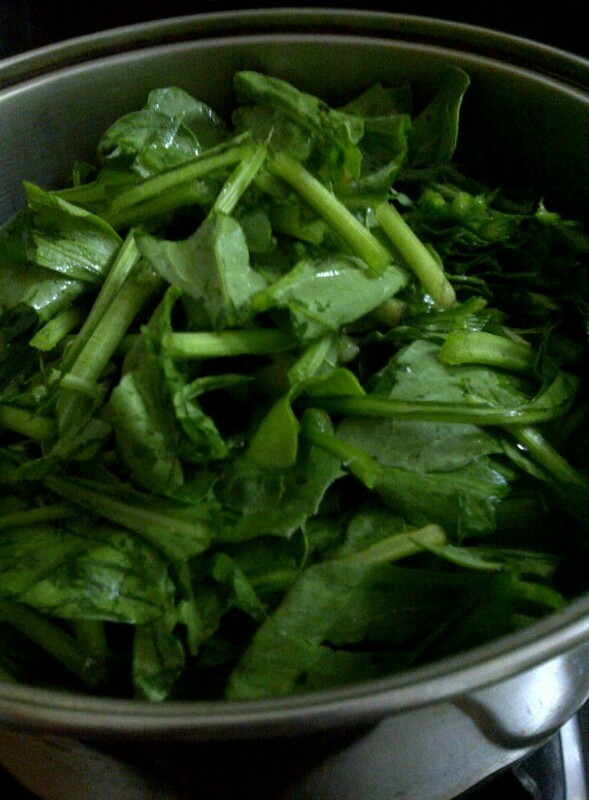 Uncover, add the coriander leaves, mix and serve. Whoever thought up this proverb must have had the foresight of these burgers. I had some mixed sprout (a combination of chickpea, black eyed beans, wheat, fenugreek, peas and moong beans) which I decided to incorporate into this totally kooky recipe of mine. The idea was to bind everything with some mashed sweet potato but when I boiled the tuber in a pressure cooker, it was not fully cooked. I cooked it again only to discover that it was a bad ‘un which went straight into the dustbin. Had no time to boil another one so decided to throw in some rice flakes (pohe) instead. A mixture of steamed mixed sprouts, smoked aubergine, carrot and pumpkin gets you these super delicious burgers. The ingredients may sounds odd but they actually work very well together. Enjoy them with some grilled/stir-fried/steamed vegetables. Steam the sprouts till tender but with a bite to them. Either grill the aubergine or smoke it on a gas burner. Once cool, peel the skin and remove the flesh. Peel, wash and coarsely grate the pumpkin. Wash and tear the basil leaves. Heat a drop of oil in a frying pan and cook the onion, garlic and chilli along with a pinch of salt. Let the onion mixture cook for about 5 minutes. Take off the heat and cool. In a large mixing bowl, throw in the sprouts, aubergine, carrot, pumpkin, onion mixture, sumac, paprika, pinenut, rice flakes, egg and salt to taste. Shape this mixture into oval or round. Crumble the oats with your hands and coat each burger in the oat crumbs. 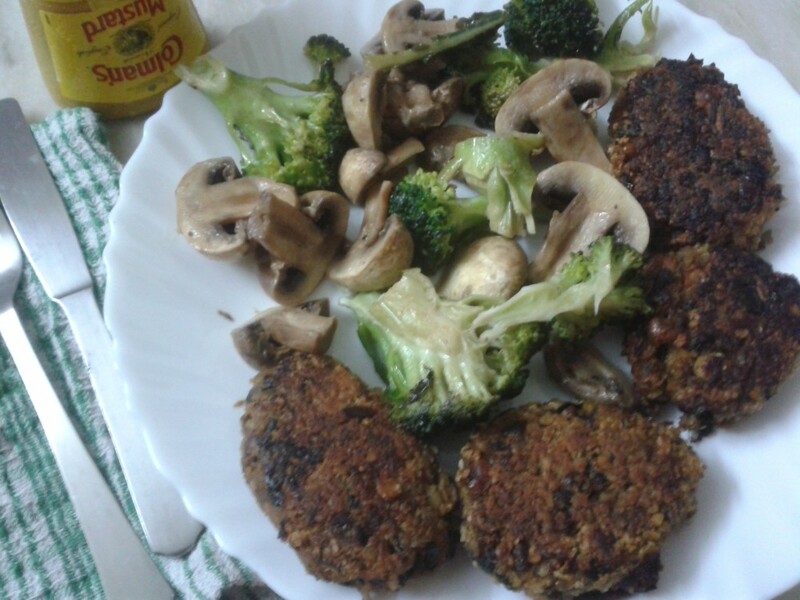 Heat the oil in a frying pan and fry the burgers, 10 minutes each side. Enjoy hot or warm. Leftover can be frozen. My sambar making skills are as recent as 6 months old. This is how I cooked it the first time round and since it turned out so well, I have stuck to it. A note on the sambar powder used. I know that homemade spice blends are unbeatable when it comes to taste but I have read many South Indian food bloggers who write that the MTR brand of masalas are as good as what you would make yourself. ‘Why fix it if it ain’t broke?’ is my philosophy so for bisi bele bhath, rasam and sambar, I use MTR brand of ready powder. If you would like to make your own sambar masala, here are some links. As for the vegetables, I tend to favour one pot meals and so to ensure that I get my share of 5 a day, my recipes usually involve plenty of vegetables. 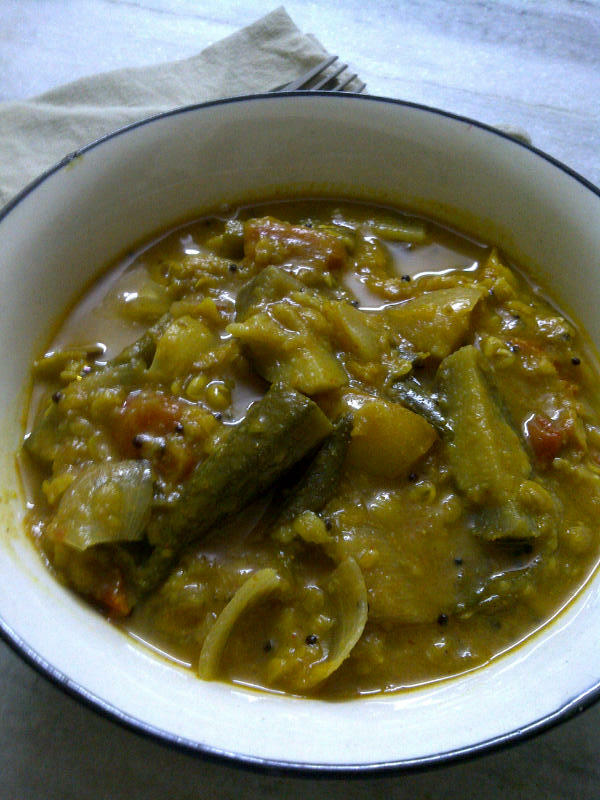 This sambar recipe includes onion, tomato, pumpkin, drumstick, okra and aubergine. You can add or subtract as per your preference but don’t skip the onion and tomato. Sambar goes well with idli, dosa, paniyaram, uttapam or even plain rice. We had ours with some non-rice idli (recipe coming up next). Soak the toovar dal and fenugreek seeds for 4 to 6 hours. Add one teaspoon turmeric powder and a pinch of salt and boil till soft. You can either do this in a pressure cooker or on the stove. 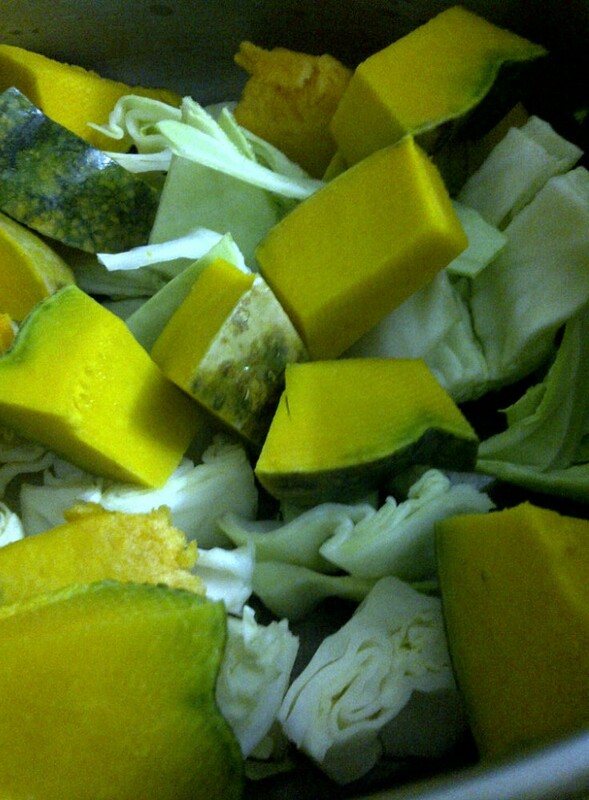 When you are ready to make the sambar, prep the vegetables. Peel and wash the onion. If using the large variety, quarter them and cut each quarter in half so you end up with large chunks. If using pearl/button/sambar onion, leave them whole. Wash and cut the drumstick into 2-3 inch pieces. Wash and cube the pumpkin. No need to peel, the skin tastes good. Wipe each okra with a damp cloth, remove the top and cut in half. Wash and quarter baby aubergine and leave it in water to prevent it from discolouring. Once the oil is hot, reduce the heat and add mustard seeds. Once the seeds start crackling, add asafoetida followed by the curry leaves. Add the onion, salt to taste and 1 teaspoon of turmeric powder. Next, add the tomato, again mix well, cover and cook for 5 minutes. After this, add the pumpkin and drumstick, cover and cook for about 10 minutes. Uncover, add the cooked toovar dal, tamarind paste, chilli powder, sambar powder, okra, aubergine, salt to taste and about 2 cups of water. Turn the heat to high and bring the sambar to rolling boil. 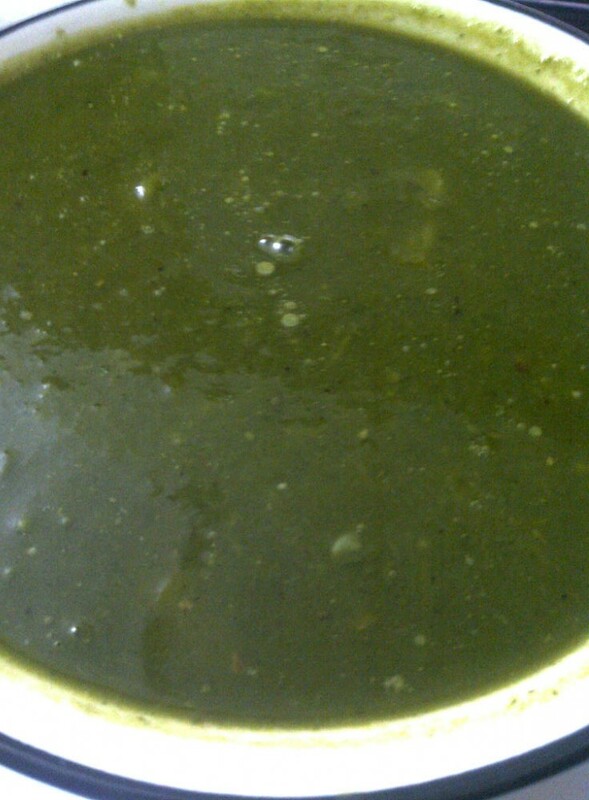 Once it starts bubbling, turn down the heat, cover and cook the sambar for about 20 minutes. Take the pot off the gas and let it sit for 5 minutes before serving. You can adjust the quantity of tamarind, chilli powder and sambar powder according to your personal taste. 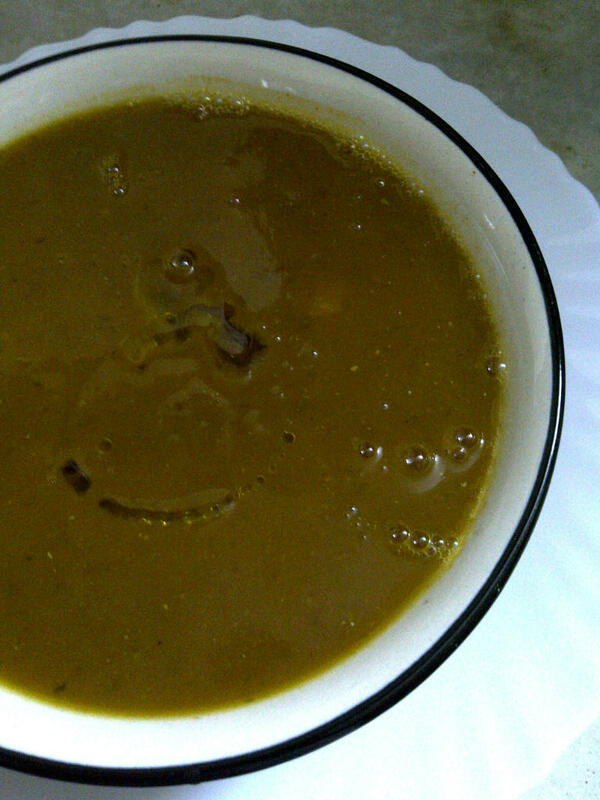 The consistency of sambar should be neither too thick nor too watery. The water measurement given here is an indication, please feel free to use your own judgement. 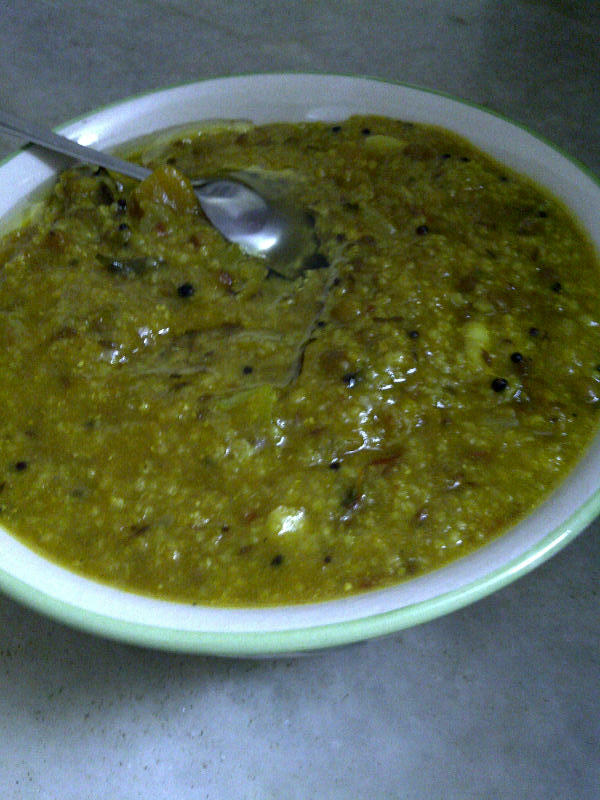 You can cook the toovar dal ahead of time. Wiping the okra instead of washing them ensures that they don’t become sticky once cooked. Any leftovers can be refrigerated. It tastes just as good the following day. I recently read an article about some under-rated vegetables which are highly nutritious and which we should be eating more of. Two vegetables on the list were snake gourd and pumpkin. 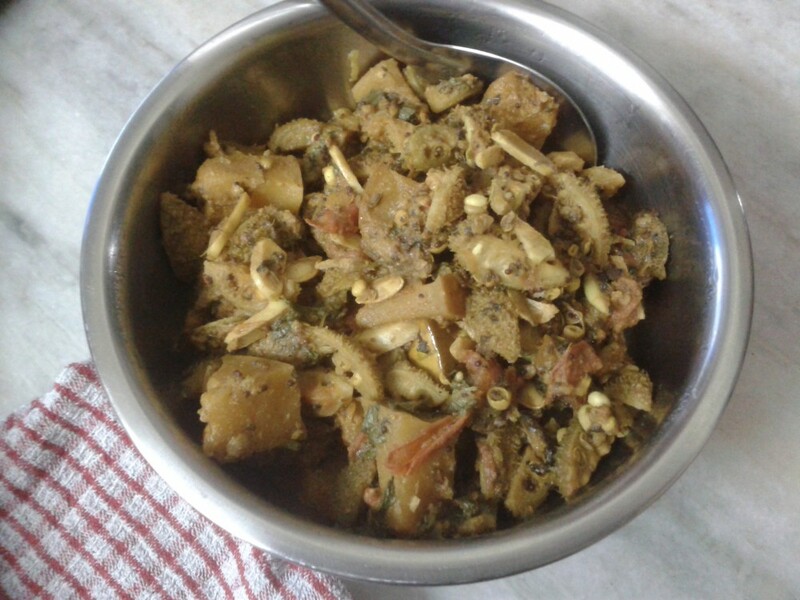 Pumpkin features on my menu every now and then but snake gourd is something I hardly ever eat. 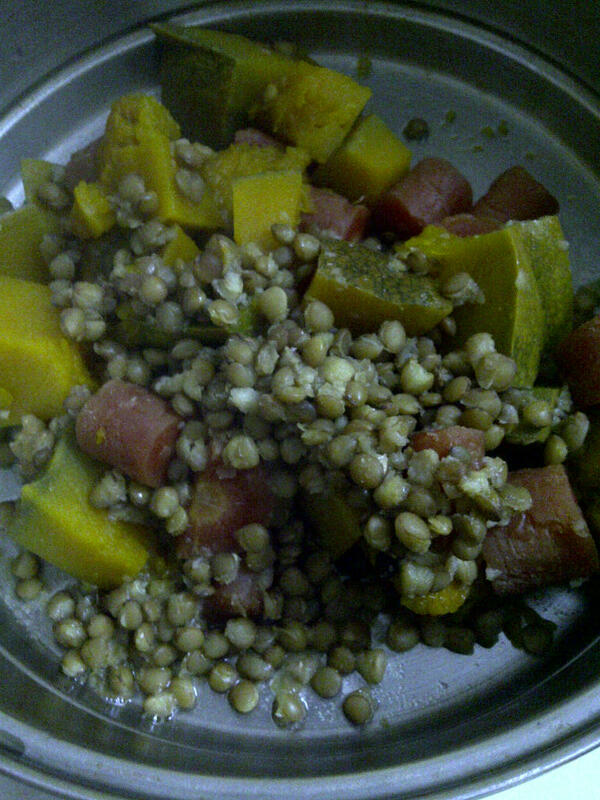 So, I decided to cook sorghum groats (jowar dalia) with these two vegetables. 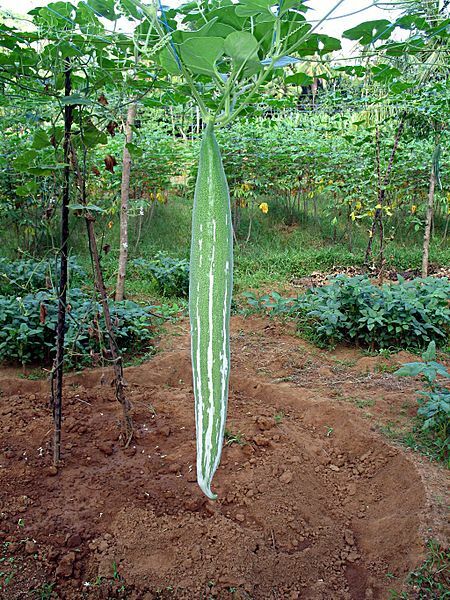 Snake gourd, also known as padwal and Chinese cucumber, is a long, narrow variety of gourd with thick skin and spongy texture within. Hollow on the inside with soft seeds, it cooks pretty fast. 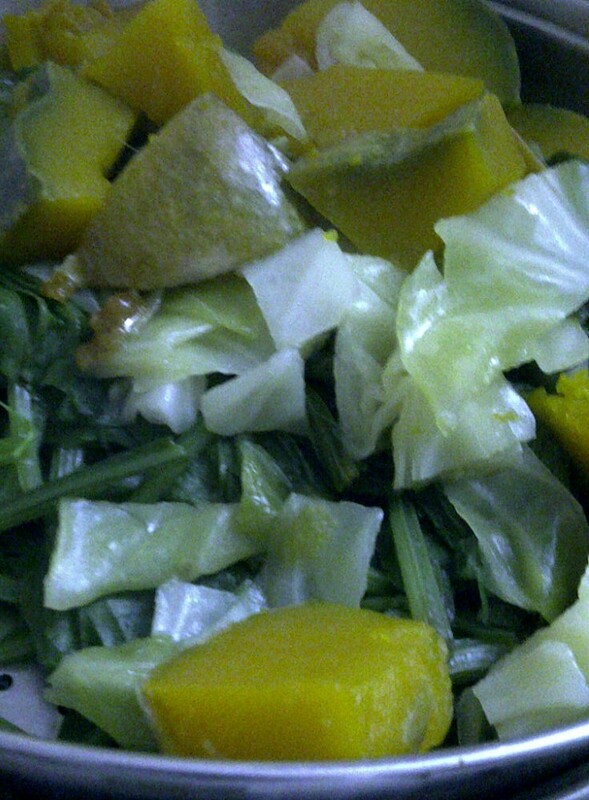 The vegetable is very low in calorie but high in fiber and a good source of magnesium, calcium, and phosphorus. The second key ingredient in today’s recipe is sorghum groat. Sorghum is high in iron and fiber and good for heart, maintaining weight, sugar level and arthritis. If you want to try this recipe and can’t get hold of sorghum groats, you can use any other variety like broken wheat (dalia), corn (makai dalia) or pearl millet (bajra dalia). Don’t skimp on the ghee (clarified butter), it will really enhance the taste. And ghee is very good for health as long as you have it in moderation. Wash the groats and lentils. Add fenugreek seeds and soak for 3 to 4 hours. Wash and dice the snake gourd. Peel, wash and cube the pumpkin. Heat the oil in a (preferably non-stick) cooking pot. When it is hot, lower the heat and add the mustard seeds. As soon as the mustard seeds start spluttering, add the cumin seeds. Once the cumin seeds start crackling, add the asafoetida followed by cinnamon stick, cloves and peppercorn. Stir for 30 seconds and add the curry leaves. Next, add the onion, garlic and tomato along with salt to taste. Uncover, throw in the turmeric powder, cumin powder, coriander powder, chilli powder, diced gourd and cubed pumpkin. Combine everything thoroughly and add the soaked groats, lentils and fenugreek seeds along with the water they were soaked in. Bring to boil, lower heat, cover and cook for about 40 to 45 minutes. If your cooking pot is not non-stick, you will have to check in-between to make sure that the food is not sticking to the bottom. 20 minutes into the cooking time, uncover, stir and make sure there is sufficient water. If not, add a little more boiled water. Once it is cooked, let it sit (covered) for about 5 minutes. Transfer to a serving bowl and drizzle with some ghee. I have to thank my friend Fatima for today’s soup recipe. 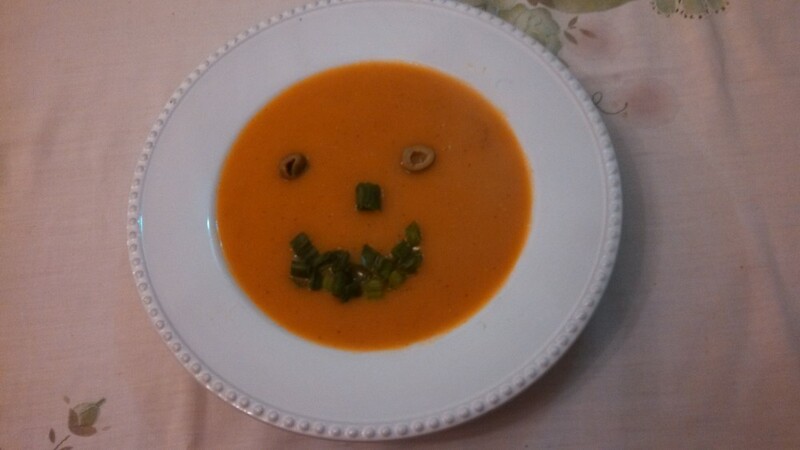 She sent me the cutest soup photograph ever (right) and wrote, “The pumpkins that don’t go to the Halloween ball end up in my plate as soup! This is a great dinner on a cold winter’s night. Its healthy too”. Just the inspiration I needed, specially since I have not made soup for a while. I have followed Fatima’s recipe except for a couple of digressions. I didn’t have the split red lentils (masoor dal) which she used so added whole lentils instead. Fatima also included spring onion which I totally forgot about. In case you are wondering about the difference in colour between the two soups, I think it may be down to the fact that I didn’t peel my pumpkin. The soup tastes quite meaty (apologies to my vegetarian readers) and full-bodied (for wont of a better term). Fatima is Goan and she suggests that you can “pour some olive oil over if you like – that’s the Portuguese style and adds to the taste.” This is what I did (you can see my inartistic attempt at drizzling some of the oil in the photo on the top!) and it is, indeed, quite nice. But of course, if you would like a fat free soup, skip this step and it will taste just as good. Fatima’s email has provided me with just the impetus I needed to resume my souping exercise so expect to see a couple more soup recipes in the forthcoming posts :-). Wash and chop the carrot. Put the above three ingredients in a soup pot or equivalent and add two cups of water. Cover and put on high heat. Once it starts boiling, lower the heat and simmer for about 20 to 25 minutes till the vegetables and lentil are soft and mushy. Now take the pot off the heat and let it cool down completely. Strain the vegetables and lentil, reserving the cooking liquor. Puree the strained vegetables and lentil and add this puree back to the cooking liquor. Pour the soup into a bowl, drizzle some olive oil (if using) and serve hot. The festivities are over, decorations have been taken down and it is back to routine as we get into 2014. In my case, this also means it is back to my alternate-day-soup regime. When I started having soup every other day beginning of last December, I felt healthier and guilt-free about the excess over Christmas and New Year. And the best part was that I actually lost weight even though I was feasting and indulging. I think this is a more practical, enjoyable and stress free approach to weight management (as opposed to over indulging and then going on crash or excessive diets to lose the pounds). 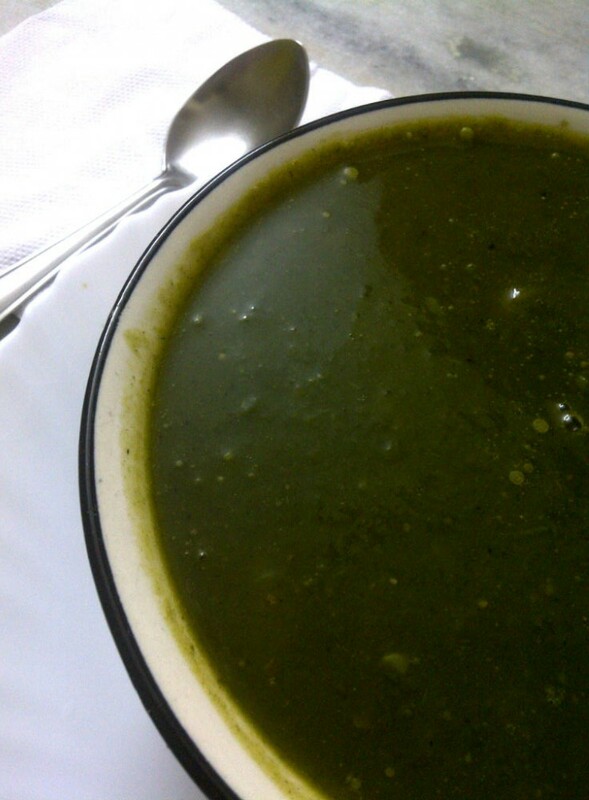 Today’s soup features pumpkin, cabbage and spinach. Pumpkin provides just the right body and a slightly sweet touch to counterbalance the otherwise “bland” taste of boiled spinach and cabbage. The soup is surprisingly flavoursome and creamy. And of course, so low in calories! First, we need to prep the vegetables. Wash and cube the pumpkin. Leave the skin on, it provides additional taste. Wash and roughly chop the cabbage. Wash the spinach. Retain stems if tender. In a large pot, put the pumpkin and cabbage. Add the stock cube, salt to taste and 2 cups of water. Bring to boil, lower heat, cover and simmer for 10 minutes. Open the lid and add the spinach. Cover and let this cook for 10 more minutes. Once the vegetables have cooled down, strain them retaining the cooking liquor. Put the strained vegetables in a food processor or a blender. You want to make a puree but try and leave whole some pieces of cabbage and pumpkin. In a soup pot, add the cooking liquor. To this, add the pureed vegetables, allspice powder and freshly ground black pepper. Heat it gently till bubbles start appearing on the surface. Switch off the burner and serve hot. I had used chicken stock cube. You can use vegetable if you prefer. If you don’t have allspice powder, blend some cinnamon, nutmeg and cloves and add a pinch of this mixture to the soup. Here is how I had chopped the pumpkin and cabbage. You can see that I’d not peeled the pumpkin. Adding spinach once the other two vegetables have partly cooked. Cooked pumpkin, spinach and cabbage ready to be pureed. Run up to the festive season, my adventure with soup has begun! 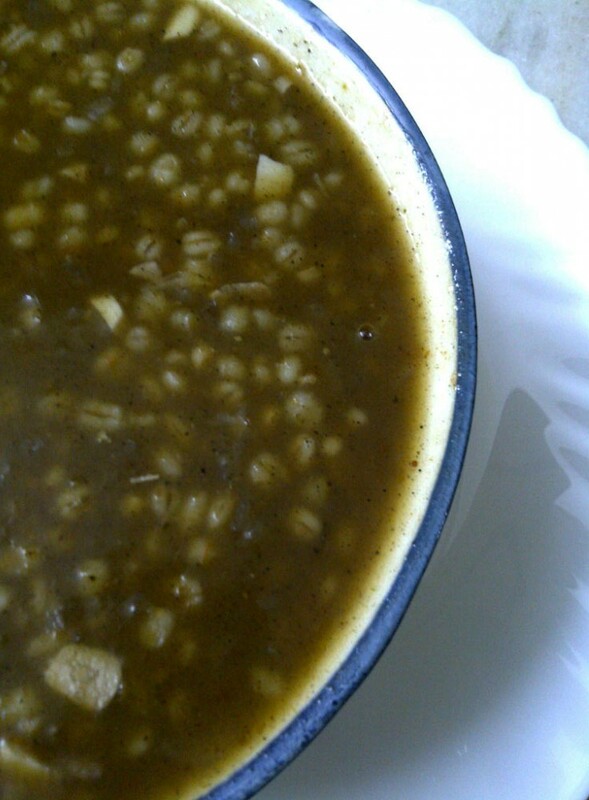 For last night’s dinner, I wanted to create a soup using one of the many grains I have in my kitchen cupboard. Here’s a very useful and interesting link to the different types of barley out there. 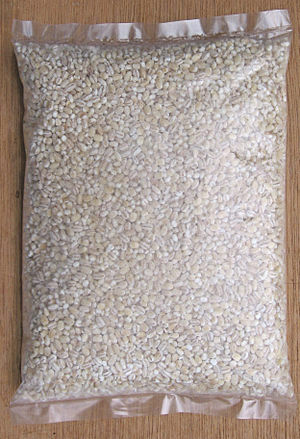 In terms if nutrition value, pearl barley falls below hulled barley since it is stripped of the outer bran layer. Having said that, it is still more nutritious compared to white or brown rice. I like the chewy texture of pearly barley. Add it to soup and you have a delightfully delicious, complete meal. The soup I made was fat free but you can use a tablespoon of oil to fry the onions if you like. First, we need to cook the pumpkin and the tomatoes. Wash and dice both, add a pinch of salt and a cup of water and boil them in a saucepan or a pressure cooker. While they are cooking, peel and chop the onions and garlic. Once the pumpkin and tomatoes are cooked, strain the liquid (stock) and keep aside. Make a puree of the cooked pumpkin and tomatoes. Heat a soup pot (or equivalent). Once it is hot, lower the flame and add the chopped onions and garlic along with salt to taste. Stir it around for a couple of minutes. Now, add the pearl barley, reserved stock, 2-3 cups of water and bring to boil. Lower the heat, cover and let this cook for about 20 minutes. After this, add the pureed pumpkin and tomatoes and the powdered allspice mix. Ad this stage, if you feel that it needs more water, add some. Stir well, cover and cook for further 20 minutes. Once the soup is cooked, let it sit for about 5 minutes before serving. Pumpkin skin is edible and nutritious so I don’t peel it. But you can do so if you like. You can substitute pumpkin with courgette. Sweat the onions in oil first if you prefer.